Dr. Taher is a Board Certified Ophthalmologist with sub-specialty training in Vitreo-Retinal surgery. Dr. Taher completed a two year Vitreo-Retinal fellowship at Boston University Medical Center. He finished his Ophthalmology residency at the University of Florida and his medical school training at the George Washington University School of Medicine. He received his Bachelor of Arts degree in Near Eastern and North African History at the University of Michigan. Dr. Taher has authored several chapters in the text “Retinal Disorders and Acute Visual Loss.” He has been involved in the research of surgical treatments for retinal vascular occlusions and laser use in macular degeneration. He also has an interest in diabetic eye disease and macular degeneration. He has also been involved in the management and treatment of ocular trauma and intraocular foreign bodies. He is a fellow of the American Academy of Ophthalmology and the American Society of Retinal Specialists. 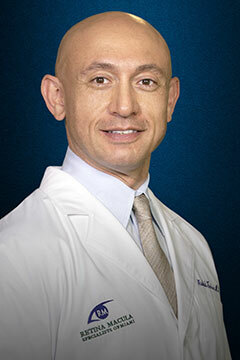 He is also a member of the Florida Society of Ophthalmology and Florida Medical Association. He also serves as a consultant for an educational company based in Los Angeles. Dr. Taher was on the Board of Directors for Pediatric Radiology of America and Cardiac America--two telemedicine companies.